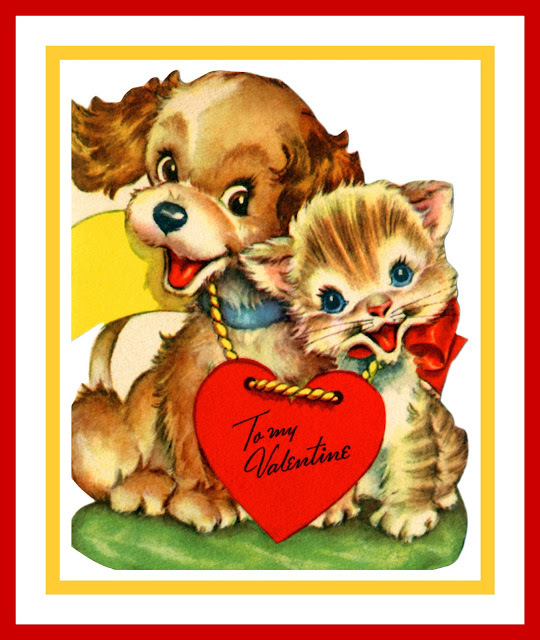 Are you reminded each year on Valentine's Day of your early childhood days when there occurred busy trading of Valentine's Day cards among your grade school classmates? If your elementary school class participated in a party and card exchange, I am sure you can remember just how exciting it was to get these cute little messages of love from each and every fellow student and friend in your grade. To celebrate such memories, this week's tablescape entitled Zesty, Peppy Love is one of several Valentine's Day tablescapes in the Valentine's Day Romantic Tablescape Blog Hop hosted by Chloe Crabtree of Celebrate and Decorate. 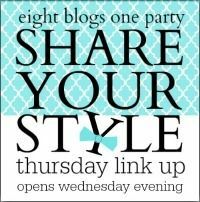 The blog hop, which Chloe has graciously organized, begins Monday, February 5, 2018 and runs until Friday, February 9, 2018. 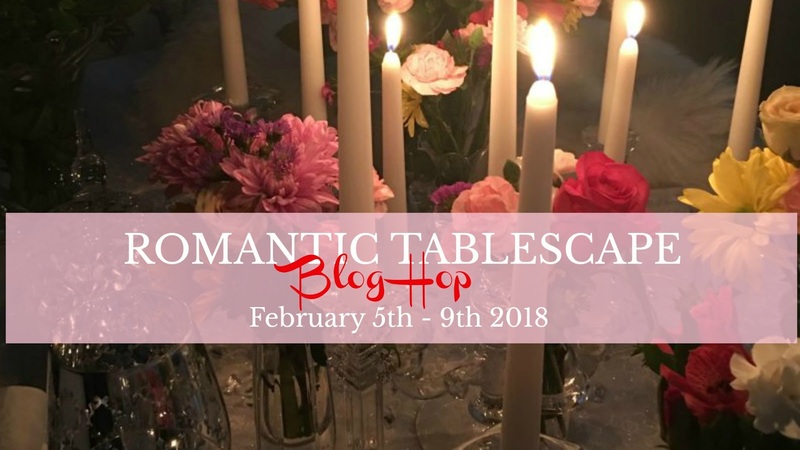 Please be sure to visit and indulge in all of the "love" created by other very talented tablescapers listed on the schedule at the conclusion of this post. 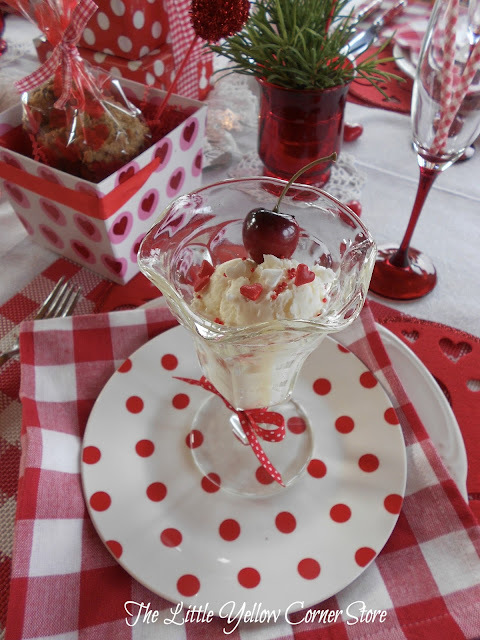 The Zesty, Peppy Valentine's Day tablescape is complete with some homemade, faux vanilla ice cream from the recipe in my previous post, Faux Ice Cream. 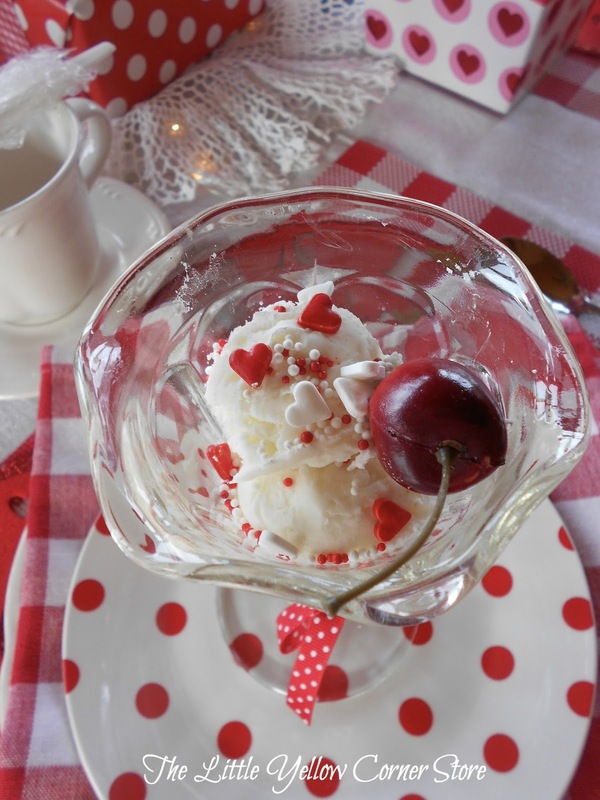 (If you happened to have missed it or wish to learn how it is made, visit: How to make Faux Ice Cream. 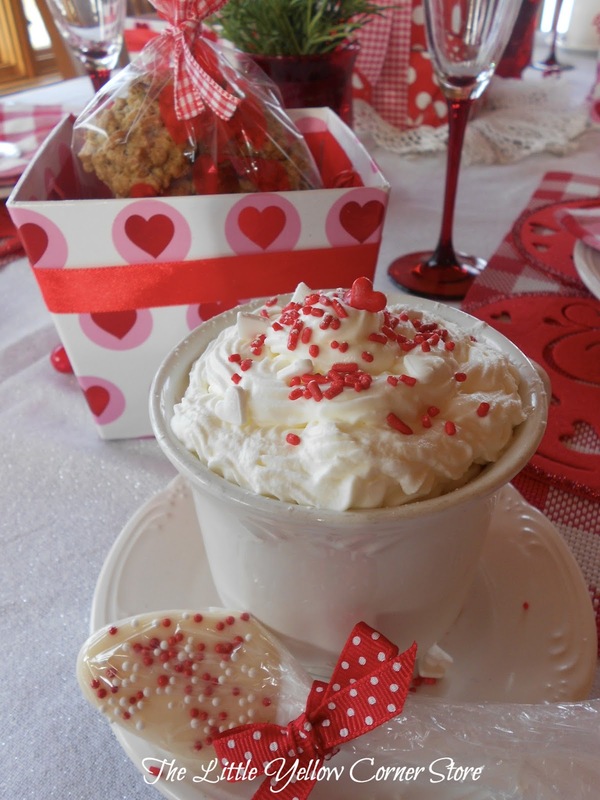 Just so that you are not entirely disappointed with the artificial ice cream dessert, some real delicious, steamy hot chocolate with a white chocolate stirring spoon and some healthy oatmeal, cranberry granola bites are served. 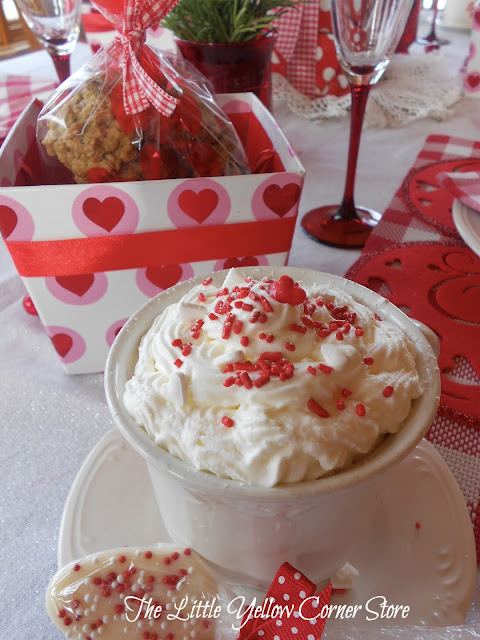 Thank you for visiting with me and I hope you have a cozy and romantic Valentine's Day. 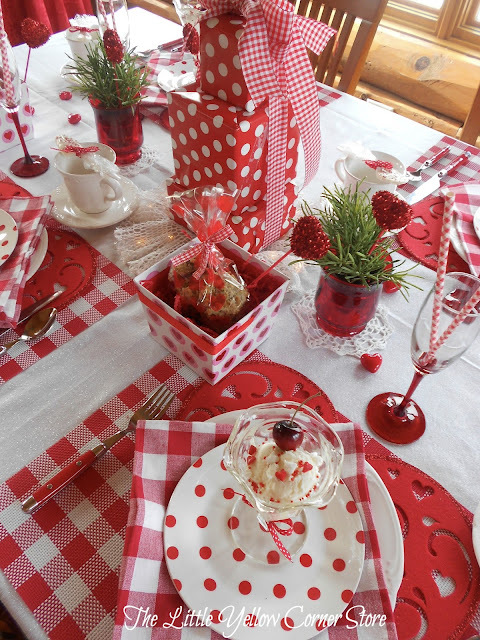 Take a moment to visit the following blogs for more creative and artistic Valentine Day tablescapes from some very bright and innovative designers. Wow! I just love the red and white checks and especially the polka dot plates. This is very festive. Such a gorgeous and romantic table. Love it! 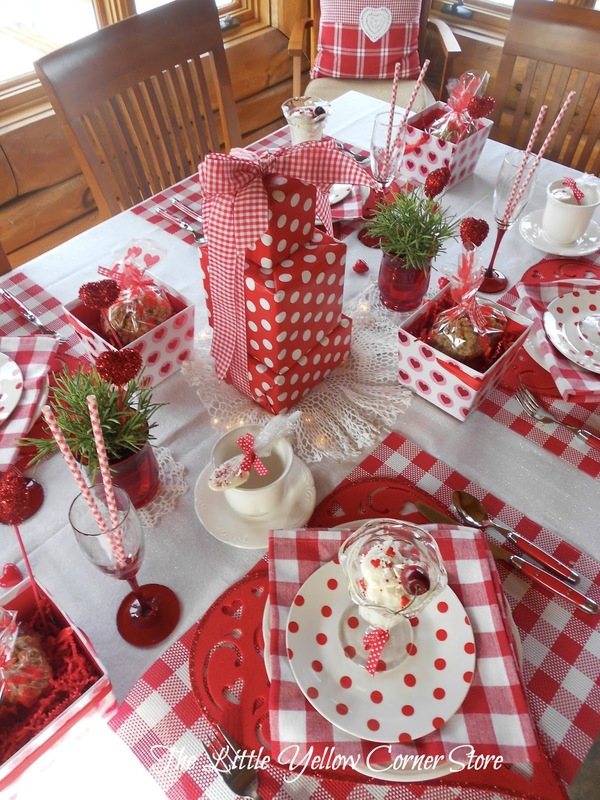 Absolutely delightful with all the red and white touches! It would be fun to find out what's in the tower of presents! 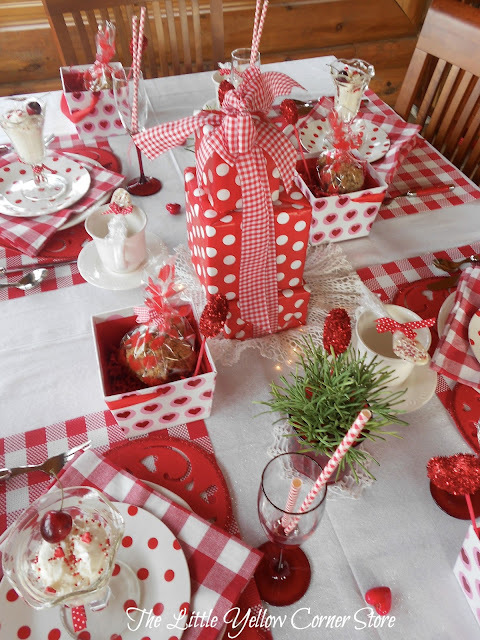 An adorable Valentines table! Loved all the great photos to pin. This table is magazine worthy, but then again all of your tablescapes are! I remember those cards. Such fun! 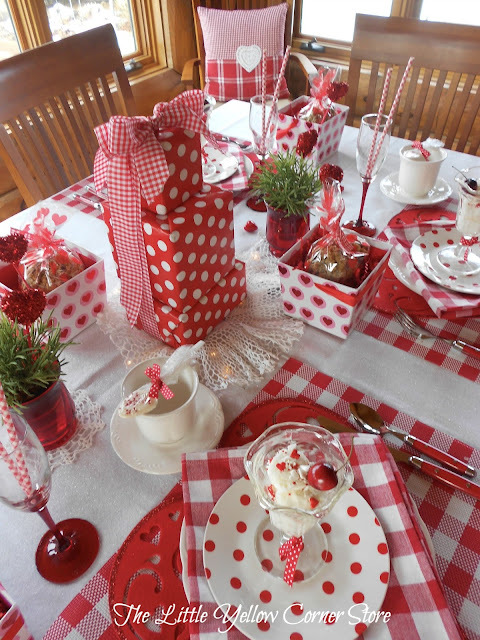 Your table is peppy and fun! Love the checks and polka dots! What a clever centerpiece of stacked packages! Yes, I remember fondly the school Valentine exchanges. My elementary teachers decorated large hat boxes for the class box. Oh, how I wish I had pictures of those. They were beautiful! I'm impressed with all your food both real and faux. How festive! 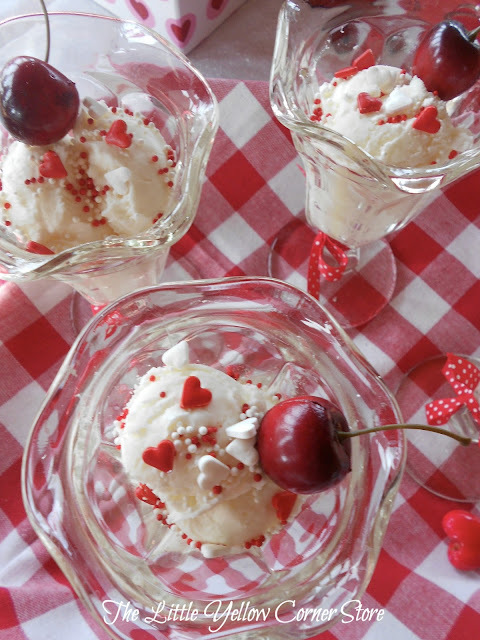 And yes, I want to eat those artificial ice cream treats!! This is so nostalgic and so adorable, Marsha! 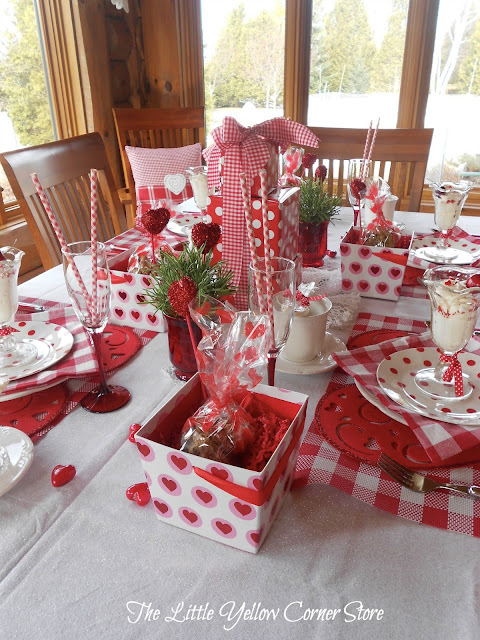 I can remember the excitement of Valentine's Day for myself and my girls when little, and your table display is perfectly titled. 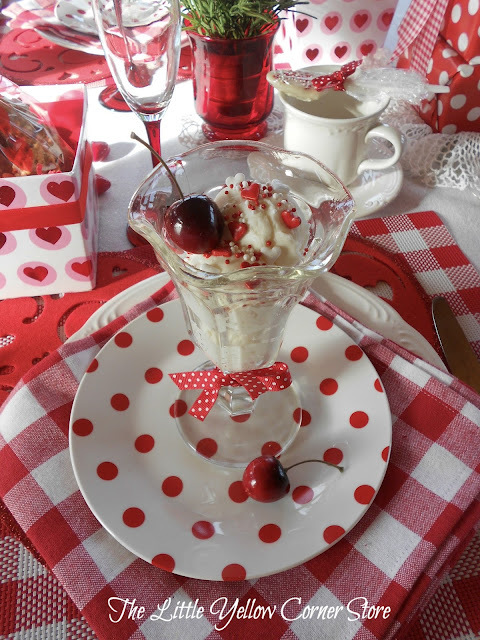 That faux ice cream is incredibly real looking, but it's the combination of all your red & white details that truly make this table so peppy. Doilies, dots, hearts and checks - I love it all. Great job and great fun! what can I say? I love love love polka dots! So cute and refreshing! This is adorable! 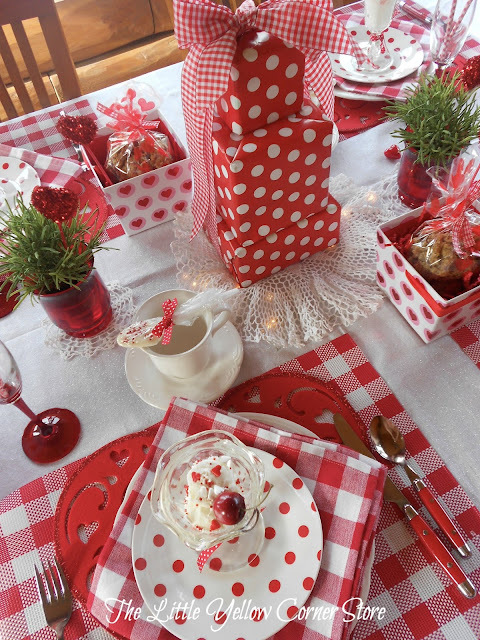 All the bold red and white patterns make your table dance! Your treats sound wonderful faux or not! Such a happy scene! Happy Valentines Day!! So cute! I love the impact of the red and white checks. 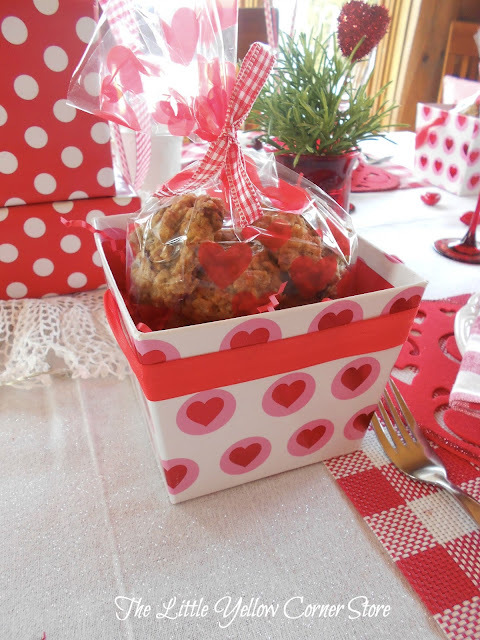 I like the heart boxes with cookies and the faux ice cream truly looks real! 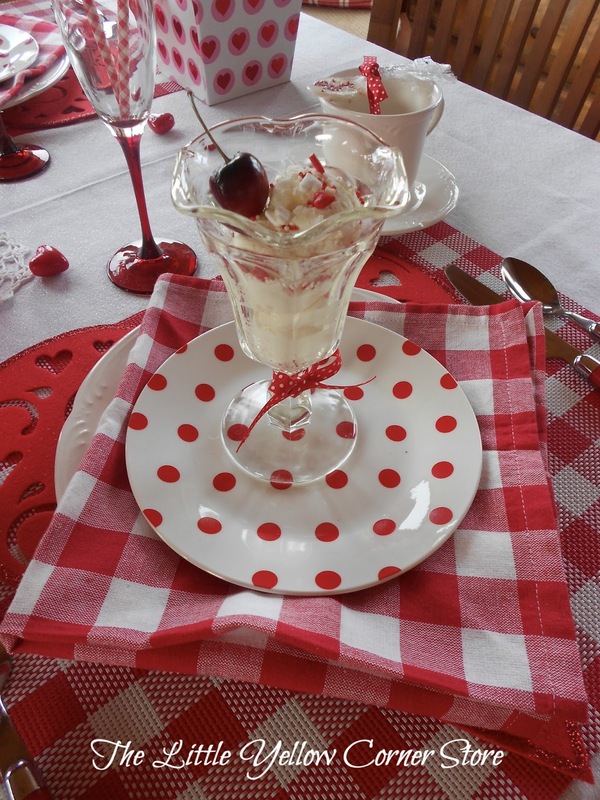 Love how you layered the polka dot dishes with the ice cream on the heart shaped placemats. We decorated a shoe box and coated them with hearts when I was in elementary school for our valentine's exchanges. I always thought it was a lot of fun! Wishing you a Happy Valentine's Day! What a fun table!! 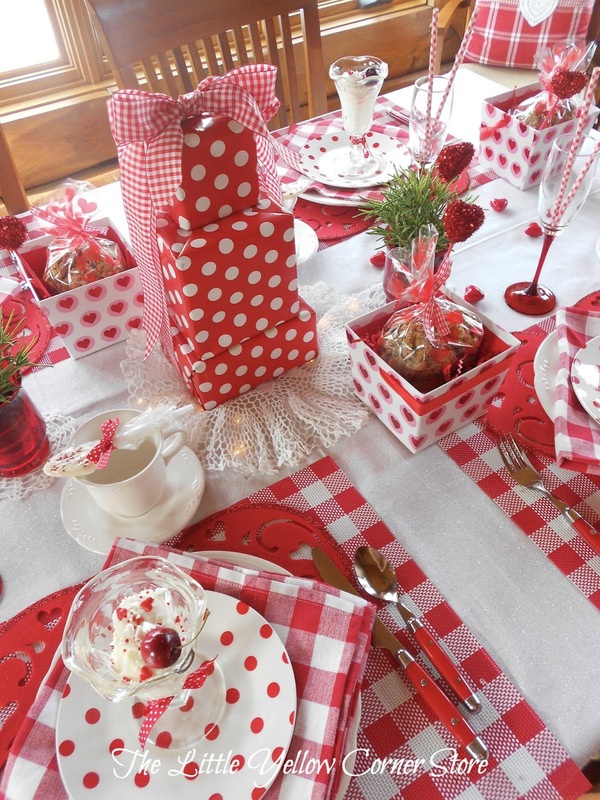 Love the explosion of checks, polkadots & hearts!! Your mix of patterns is wonderful. 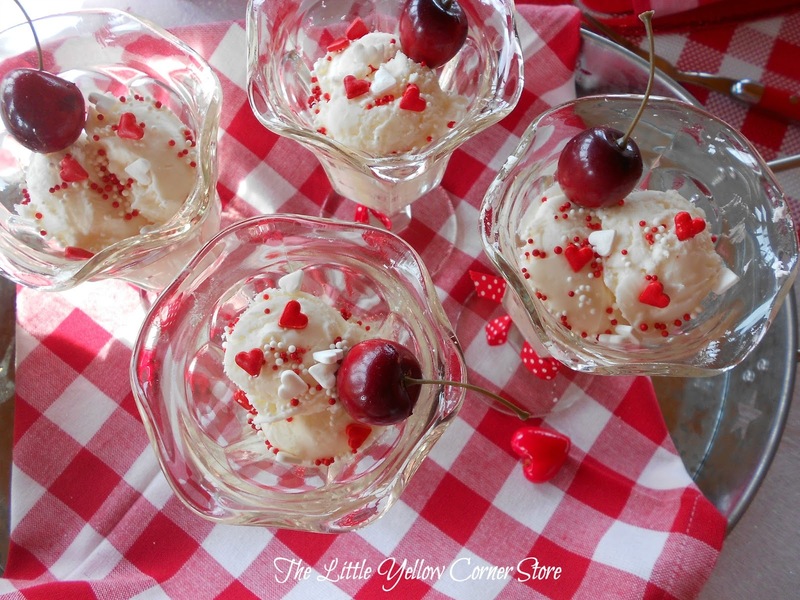 I do have a sudden craving for ice cream and its only 9:30 in the morning! 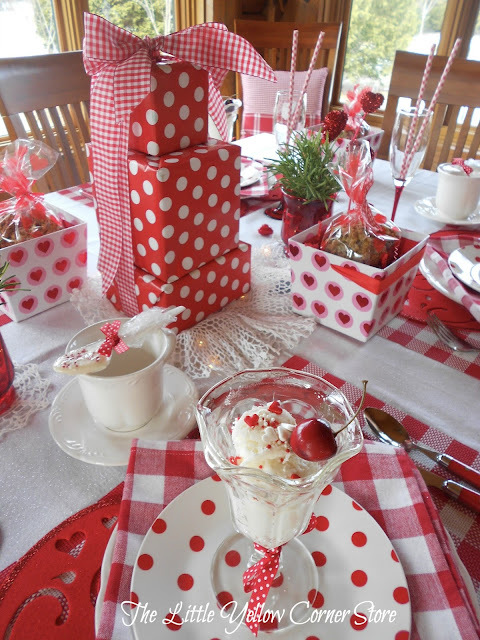 It all looks like a true valentine's party we used to have at school in the good old days before they quit having room mothers and snacks! 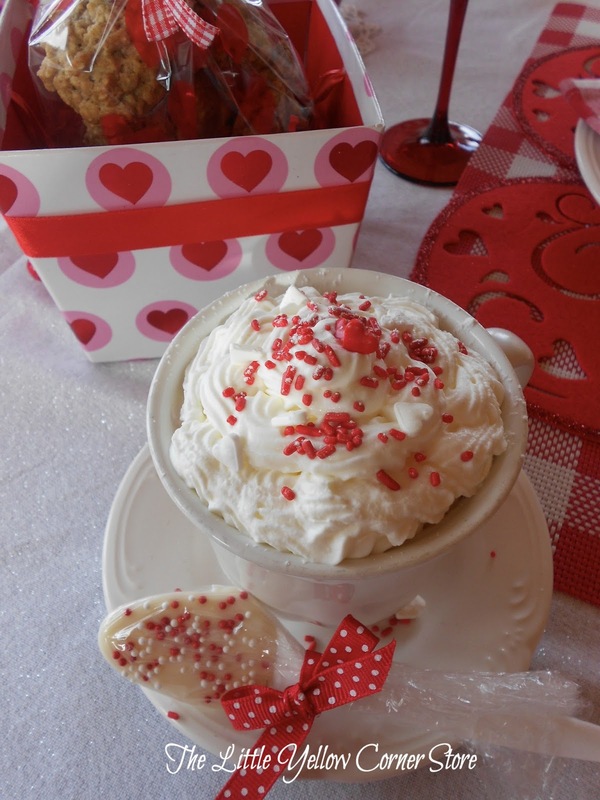 Have a sweet Valentine's Day! I really am loving the red and white checks and polka dots and hearts. The layering is spot on. It all works beautifully together. Faux ice cream must be a food stylist trick. I'll definitely check that out. I love traditional red and white and you have done it so well! The checks and polka dots are so much fun. I remember your faux ice cream post and it really does look real. Hot chocolate sound great! Your table speaks fun for a Happy Valentine’s Day! 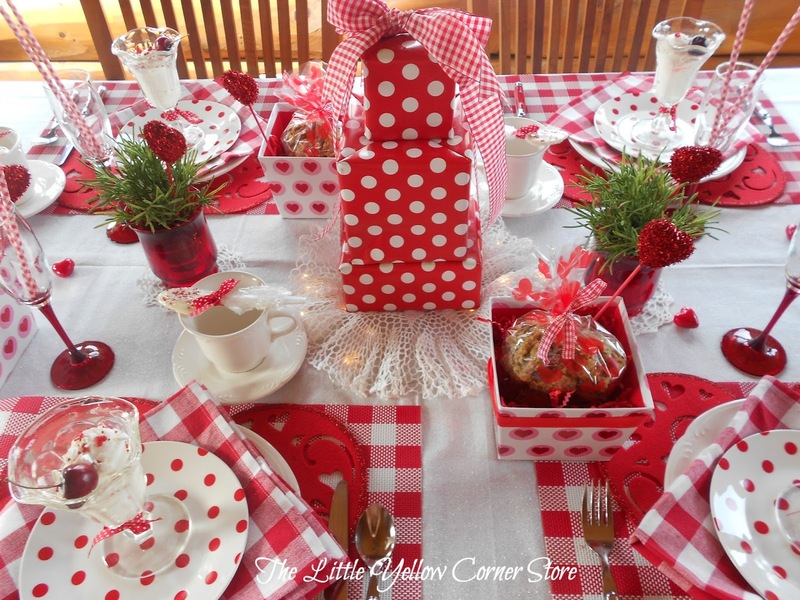 This table is just adorable with red polka dots and checks. Everything looks just beautiful! I hope that you have a very Happy Valentine's Day!!! 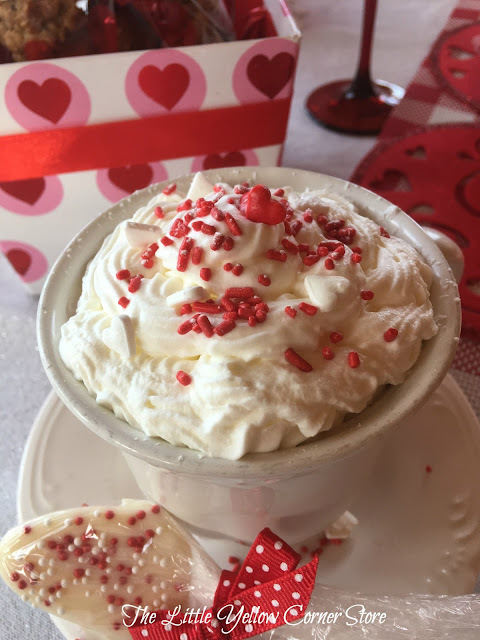 I love this traditional and nostalgic tribute to Valentine's Day and all of the wonderful memories, fun, joy and sweetness of this whimsical holiday. Really enjoying the red and white and the layering of is fabulous! 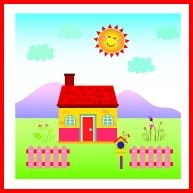 Hopping over from Blue Sky at Home blog and so glad I did. How cute is that table?! 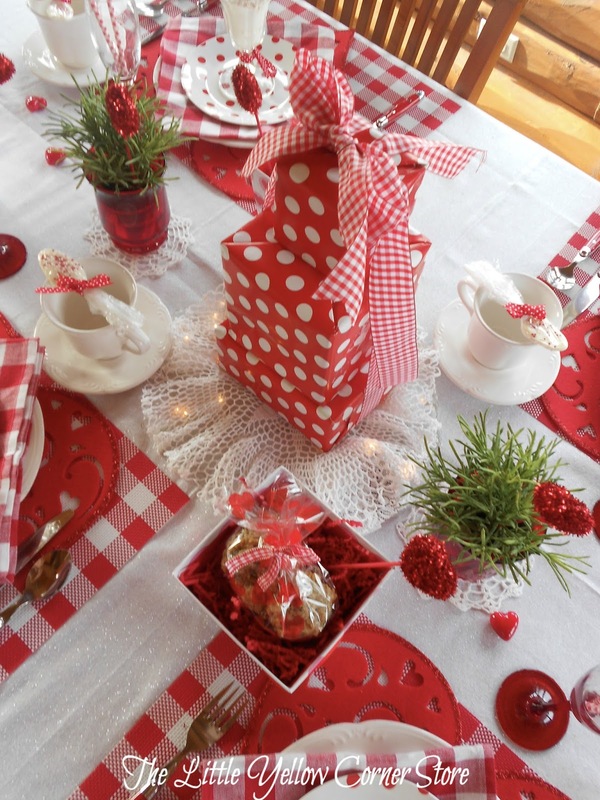 I would have never thought to wrap boxes and tie with a bow for a centerpiece. That is down right adorable. Everything looks so festive. Love it all - even the fake ice cream! Oh! I love this colour and pattern combination - with the red and white polka dots, checks and hearts! 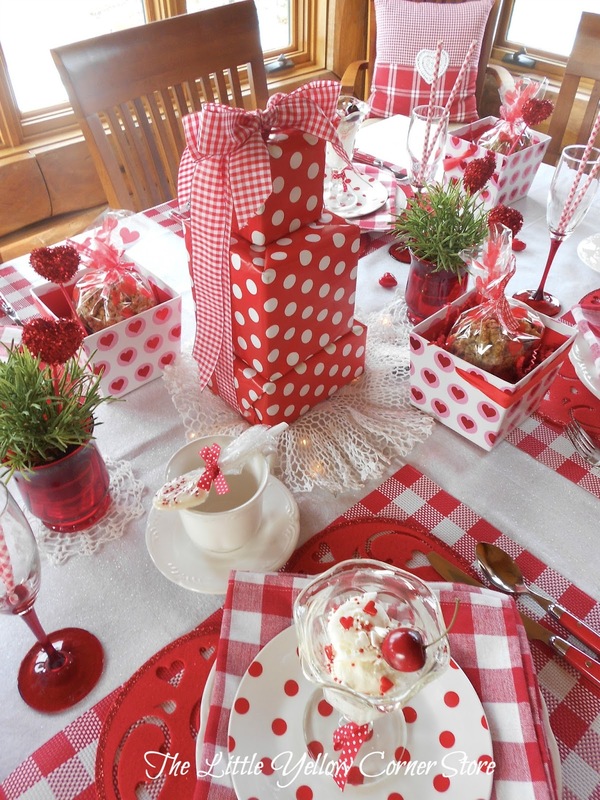 Your tablescape definitely captures a peppy and zesty vibe for a Valentine's party! 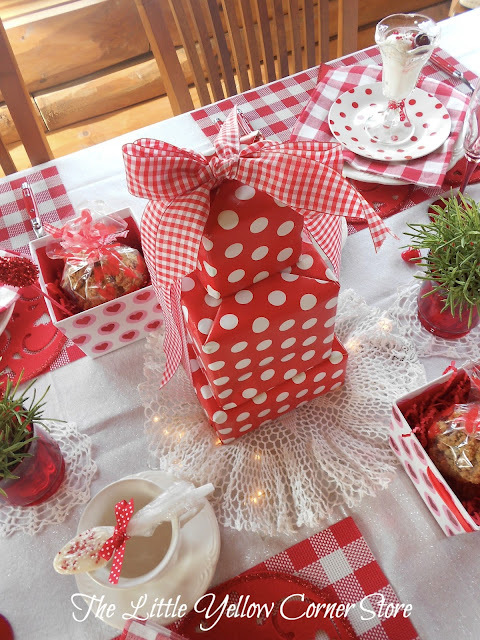 So many pretty details like the boxes the cookies are in and the tower of presents on the pretty crocheted doily as a centerpiece. Would love to enjoy a cup of the hot chocolate while taking in all the details of this table! Also enjoyed your lead up narration and reminiscing about elementary Valentine's! 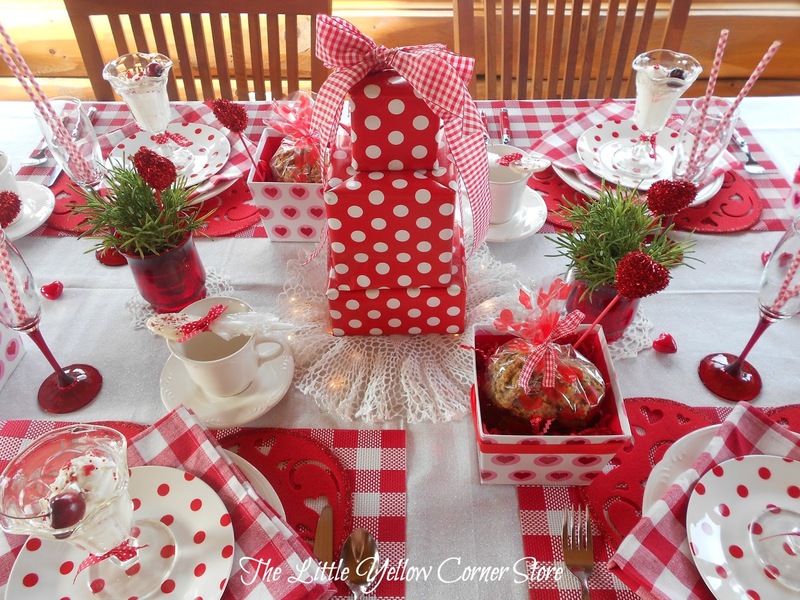 I love the mix of plaids and polka dots. The mood was so cheery, and the heart sprinkles and cherries looked great on the faux ice cream. 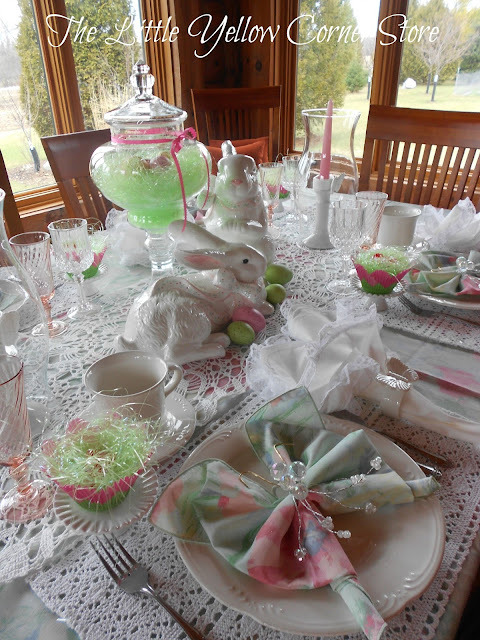 Thank you for sharing your festive and reminiscent inspired table! Looking good! I have a huge sweet tooth, so if I showed up to a dinner and the tablescape was chock-a-block full of delicious sweets I would be in heaven! Happy Vday! Such a "sweet" table. Love the red and white check. So fun with your mix and check and dots. bright and full of joy! beautiful! I always look forward to your tablescapes, and this one is no exception. 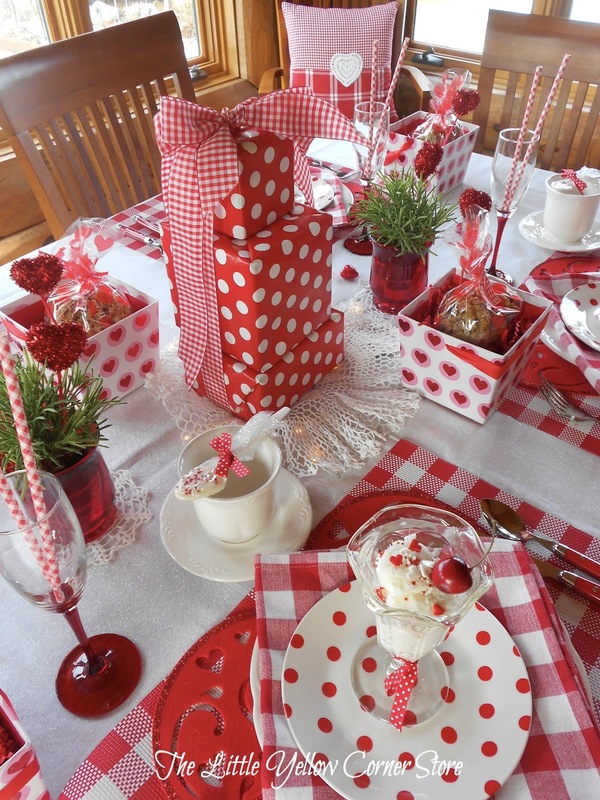 I love the red and white and mix of checks, polka dots and hearts! What a fun table for a Valentine's celebration! This table setting is so festive, cheery and sweet. I really love it. I love your Valentine tablescape! I must have those plates now! Having a family of 8 does make dishes expensive! :) I love it all! Thanks for the inspiration you've added to my Pinterest board! 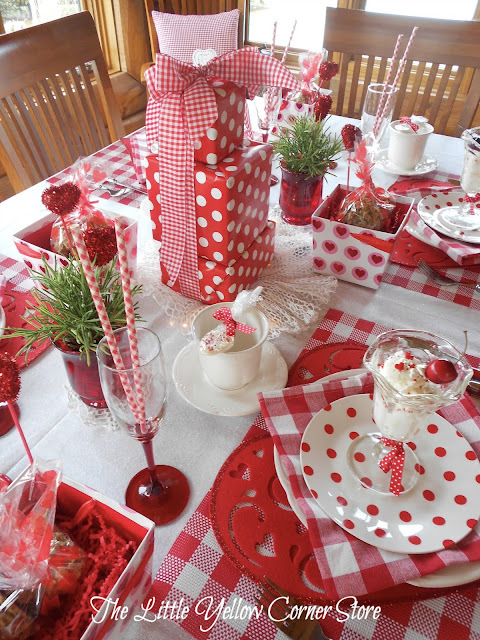 This is such a fun and cheerful Valentine's Day table! 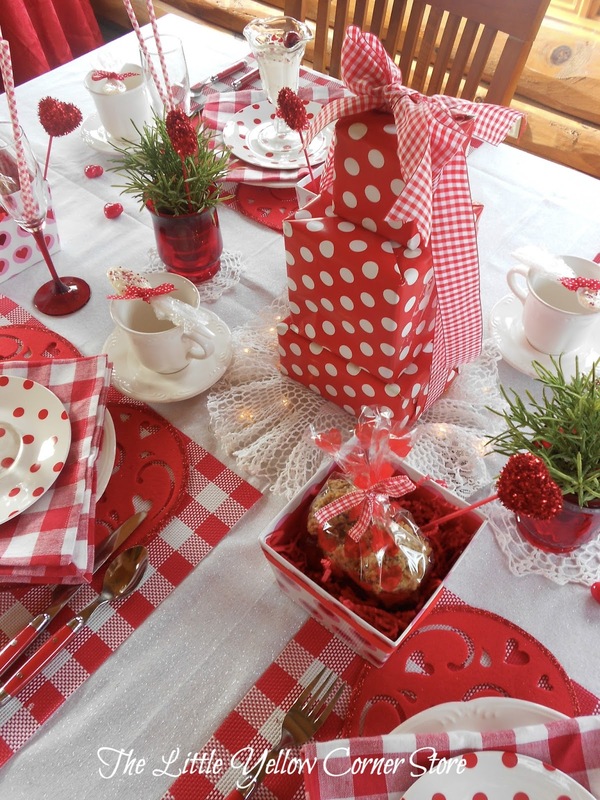 I love the polka dots and the classic red colors! So pretty!